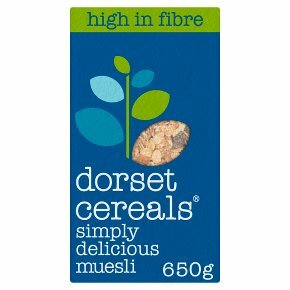 Honest, tasty and real.Now with juicy chilean flame raisins.30% fruit, nuts&seeds.A scrumptious blend of raisins including juicy jumbo chilean flame raisins, sunflower seeds, dates, roasted hazelnuts and brazil nuts with multi-grain flakes.850g of unadulterated breakfast pleasure.Formerly known as Deluxe Muesli - you'll notice some great new changes to our packs. We've made them easier to open (no more spillage) and easier to store. We've also added our signature ingredient, chilean flame raisins, to this recipe, as we love them so much.Have you discovered our other delicious recipes?Visit our website to find out more.Look, no dust!We're always trying to get better and better and would love to hear from you with any ideas you might have.We believe that life really is too short to settle for second best and that simple, honest pleasures are often the most rewarding.We take delicious things and add some more delicious things, then we mix them up a bit. We try lots of combinations. The ones everyone here likes, we make.There are many simple pleasures in life - walking bare foot in the morning dew, a friendly smile from someone you have never met and eating a bowl of simply delicious muesli.Simple, but then the best things in life usually are.Handy to know.It takes 4kg of grapes to make 1kg of raisins.Brazil nut trees only grow in the wild where they can be pollinated by only one type of bee.Chilean flame raisins come from red grapes and are really juicy. Allergy advice.Contains gluten, nuts and wheat.May contain traces of sesame seeds.Add whatever you like; chopped bananas, fresh strawberries or just some ice-cold milk.Best enjoyed.Serve with milk, yoghurt or fruit juice for a delicious and nutritious breakfast.Good to know.Vegetarian Society approved.High in fibre.No added preservatives.Contains wholegrains.No added salt.Low in sodium.No added sugar.Contains naturally occurring sugars.The pack contains about 11 servings.